The June 2015 issue of Anthropology & Aging features the latest commentaries, articles, and reviews, available free now through our open-access agreement. In addition to our usual content, this issue includes a commentary/response format first introduced in the special issue on the body (33.3) and reintroduced in this issue by Maruta Vitols and Caitrin Lynch’s piece on representations of aging in films and a reflective response by A&A co-editor Philip Kao. Stephanie May de Montigny’s Portfolio continues this discussion of performance, narrative, and creativity on the stage. We hope these contributions spark more interest and interaction here on our blog as well as in cafes and classrooms everywhere! Every issue of Anthropology & Aging that we produce depends on the skills and time volunteered by our editorial staff, our board, peer reviewers, and digital publishing support. This issue is especially exciting because also it showcases the work happening across the Association of Anthropology and Gerontology—from supporting student work with the Margaret Clark Award, to the international conference held last February. Anthropology & Aging 36(1) begins with an commentary adapted from the keynote address delivered by past International President of Médecins Sans Frontières / Doctors Without Borders (MSF), Dr. Unni Karunakara at the 2015 AAGE Conference on “Health Disparities in Aging” hosted by Florida International University. Dr. Karunakara writes from the front lines of global public health and humanitarian response, and his evaluation of the recognition (or lack thereof) of the important roles of older people in high risk, post-disaster circumstances reveals the need to rethink how aid organizations are held accountable for including older adults as a priority in their work. In addition to Dr. Karunakara’s Keynote, the AAGE conference also provided a chance for our organization to support student research and professionalization. One of our banner activities in this regard has been the awarding of the Margaret Clark award for student papers. In 2014 AAGE awarded two Margaret Clark Awards, one at the graduate level (Ben Kasstan, Durham University), and another at the undergraduate level (Lilly Lerer, University of Chicago). The awardees both revised their papers into articles and braved the peer-review process to be accepted for publication in A&A. Ben Kasstan’s article focuses on the voices and experiences of Shoah survivors at a UK day center mediate their experiences of past trauma by incorporating elements of Judaism, literally through food and memory. 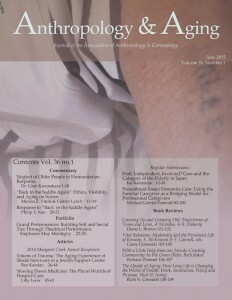 Lilly Lerer’s article is a sensitive and intimate account of her fieldwork with hospice patients and staff as they mutually embody a temporality of ‘slow care’ that contrasts with the efficient and cure-centered care of the biomedical end of life settings. Care is a theme running throughout this issue, and, as the authors note, throughout current discussions of doing anthropology in the Anthropocene. Two additional articles in this issue take up the theme of care for older adults. Iza Kavedžija’s ethnographically rich depiction of community care in urban Japan looks at the co-productions of categories of ‘elderly’ and ‘carer’ as individuals move through various care settings, employing symbolic and linguistic cues that mark roles and relationships along a spectrum of social potentialities. Fetterolf, a student member of AAGE, examines healing in Alzheimer’s care in the US, adopting a case study approach, proposing that close attention to personhood creates ‘bridges’ to providing better care. Enjoy this issue and we look forward to bringing you our next special issue on “Aging the Technoscape” in the Fall. CFP is still open until June 30 for this issue, and general submissions on other topics are always welcome!